MGM has been building transformers for use in high rise buildings for over 4 decades. We have partnered with some of the largest utility companies in the country and have an extensive install base in many cities across the US. The following information is a guide for a high-rise transformers along with the installation and system requirements from the manufacturer. Medium voltage distribution circuits (typically 15 kV to 25 kV) in high-rise buildings are used because they offer higher efficiency and lower cost. MGM Transformer’s high-rise type transformers were developed specifically for these unique power distribution systems. In these systems, power circuits branch from the main high voltage bus to high-rise transformers which then step the voltage down to feed individual user’s panels. Using a medium voltage main bus is less expensive than a standard low voltage bus which uses much larger cables and junction boxes. It also has lower losses and therefore offers superiorvoltage regulation and lower operating costs. MGM Transformer’s high-rise transformers having other options which make them even more desirable to the high rise use. MGM’s units can have far lower dB levels than standard for quiet operation. Since the units are indoors the noise can become irritating to those inside the building but we can make the units 10 and sometimes 12db below NEMA standard to take care of that problem. Other options we can include would be high voltage bushings or bushing wells, incoming high voltage fuses with optional disconnecting means, provisions for lightning arresters, continuous overload capability, hinged panel access to high voltage compartment and an energy saving DOE 2016 efficient design. We can also include a special trip device designed to blow fuses and isolate the transformer in the event of a fire. Finally, these transformers are drytype so there is no need to worry about the possibility of oil leaks. Dry types don’t require special maintenance and they are simple to install. MGM Transformer’s high-rise transformers are the perfect power transformer solution for high-rise condominiums, apartments, office or other similar buildings. This specification covers medium voltage single and three phase, ventilated self-cooled dry-type dead-front distribution transformers specifically designed for indoor installation in high-rise apartment, condo or office buildings. Standard voltage taps are +2, -2 x 2.5%, however, other configurations are available. The transformer is a ventilated, open wound VPI dry-type. The coils are cooled by natural circulation of air through the windings. The insulation system for the transformer windings is a UL® listed 220°C (Class R). Winding layer insulation is DuPont Nomex®. The core is constructed of non-aging, high permeability grain oriented silicon steel. All core laminations shall be step-lap mitered cut, free of burrs and stacked without gaps. The core framing structure is of rigid construction to provide full clamping pressure upon the core and provide the support points for the coils. Coils are adequately braced for full short circuit capability. The core and coil are supported by vibration isolation pads to effectively dampen vibration transferred to the transformer enclosure. Transformer coils undergo a vacuum pressure impregnation process to eliminate air voids within the windings using a high build polyester resin. Upon placement of coils on the core legs, the top core yoke is stacked, the core is tightly clamped and all necessary leads are connected to the bus components for customer connections. Protective coatings for the core and metal bracing components are applied. The enclosure includes provisions for rolling, skidding, lifting, and jacking for installation. All parts of the cabinet are made with at least a 12 gauge thickness. The bottom plate has openings to allow air in but they’re small enough to prevent rodents from entering. The front and rear panels have handles for easy removal. Side panels have cutout openings for cable entrance. Two cover plates are provided for the openings. Lifting provisions are made of corrosion resistant material and so arranged to provide a suitably balanced lift for the completely assembled unit. The top section serves as the high voltage compartment door used to access fuses, arresters, shorting switches and internal bushing well connections. Our state of the art powder coat paint finish is apparent on all our enclosures. Enclosure parts are painted with electrostatically applied polyurethane powder coat paint then baked for optimum hardness and finish. Paint color standards are ANSI 61 or ANSI 49 however we can customize to your order and paint in any custom colors desired. A 2 inch stainless steel grounding is installed on the outside of the side panels above each of the cable knockouts openings. Each pad is provided with two holes horizontally spaced on 1-3/4” centers and tapped for ½”-13 NC thread. Internal connection (by removable strap or cable of #4/0 copper capacity) is made from the core frame to either case grounding pad. The high voltage is supplied with 200 amp bushings with removable stud on each ungrounded phase. Bushing are installed with a keeper plate / clamping ring furnished with grounding provisions. Bushing wells are installed in a top mounted removable fuse chamber for three-phase units and in the top fuse compartment section for single-phase units. nameplate loads. Terminals are located near the front of the enclosure at the base of the core and coil assembly in a horizontal configuration. Terminals have a minimum air clearance of 1.5 inches to the front panel. inches. The uppermost terminal is vertically positioned no less than 8 inches from the top edge of the lower panel. Nameplate is anodized aluminum with ratings shown as required in IEEE C57.12.01. The fuse symbol is displayed on the fuse access panel. Below the symbol, stencil “DANGER – De-energize this transformer before opening or removing this panel or operating the fuse”. A thermally operated spring shorting switch is installed in the fuse compartment on the enclosure for each ungrounded phase in a manner which insures positive grounding of the load side of the fuse clip when the thermal switch is actuated. The thermal shorting switch assembly is shipped from the factory with the fusible link disengaged. Three phase shorting switches are designed to mechanically trigger all three switches simultaneously. A bare #2 copper ground wire shall be installed connecting the shorting switch to the ground bus or terminal. compartments are removable. Fuses may be “clip-style” or incorporate load-breaking capability. Fuse ratings are to be specified by the customer to meet system and code requirements. Mounting provisions for distribution class surge arresters are provided in the upper fuse compartment. 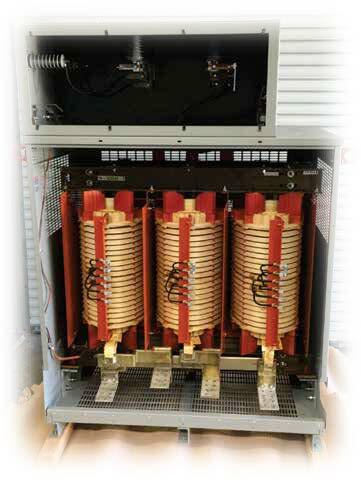 The transformer efficiency must meet or exceed the latest U.S. Department of Energy regulations for dry-type transformers in 10 CFR 431.196 computed at 50% load and 75°C. Transformers are capable of continuous overloads in accordance with the table below without exceeding the temperature limits of the insulation system. Overload ratings are identified on the nameplate. The manufacturing facility is an ISO 9001:2015 registered facility. The following tests are performed on each transformer in accordance with IEEE C57.12.91. Final Test Reports in the proper IEEE format will be furnished for each unit upon request. 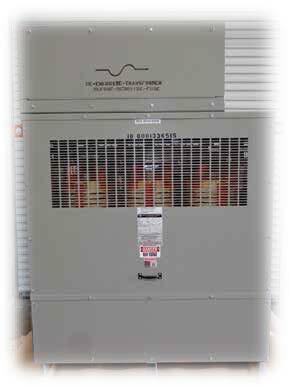 Transformers are wrapped in a weatherproof covering as required and mounted on suitable skids. All temporary shipping hardware and brackets are painted red for ease of identification for future removal. Instruction manuals are shipped with each transformer.